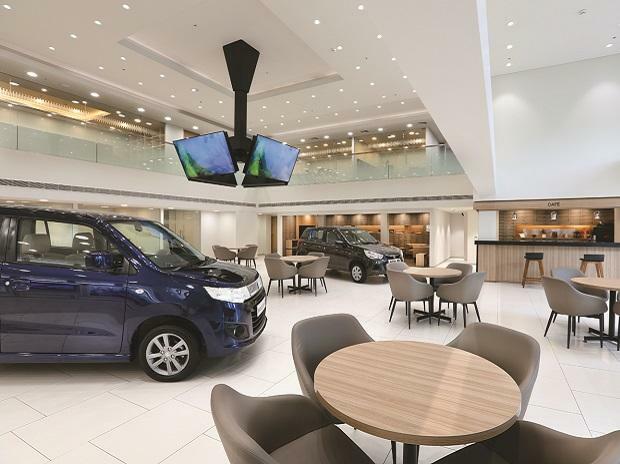 An all-new Arena showroom, aimed at buyers of Maruti Suzuki’s mid-priced to budget brands. Over the past year and more, auto companies have focused big on experience, relying more on crafting an easy and memorable engagement rather than just on new launches and refurbished models to keep customers coming back for more. Maruti Suzuki has branded its showrooms under three labels: Nexa (premium), Arena (mid to budget) and True Value (used) and earmarked Rs 1,000 crore for Arena alone in the current fiscal year. Tata Motors has set aside Rs 2,500 crore for revamping and expanding its showrooms and Skoda is investing Rs 100 crore to do up its existing outlets. The aim is to create a brand identity that meets the aspirations of a newer, younger and digitally savvy set of customers. Maruti Suzuki was one of the early movers when in 2015 it launched the premium sales channel, ‘Nexa’. The aim was to convey a sense of exclusivity and create a perceptional shift towards Maruti that was largely known as the affordable Indian brand. The company looked at building a more reliable and easy interface for customers and dealers and; the sales team was armed with digital devices to offer customers a complete picture of the brand. Maruti says it trained its workforce and designed its showrooms to create a ‘business class’ among car dealerships. The company has 280 Nexa outlets nationwide and is now upgrading its old showrooms under the newly launched Arena brand. “The new showrooms are designed to address the online and offline expectations of our customers and fall in-line with their new lifestyle,” a spokesperson from Maruti Suzuki said. Revamping involves creating a smoother technological interface that lets customers plan purchases remotely, cutting down the number of visits to the dealer and yet increasing the interaction with the brand. “Customers want simple, non-complicated, trendy, modern and dynamic brands. In the do-it-yourself era, they spend lot of time searching for right brand online. They like to plan their appointments, pay online and book their service and we want to bring all this under one roof through Arena,” added the spokesperson. According to a recent study by JD Power, car buyers are using the digital medium more than ever before. Analysts say that customers do not hesitate to spend time getting to know the product fully before taking the leap. Besides more than 58 per cent of customers who browsed the internet to research their auto purchases in advance are younger than 35 years and; 80 per cent are university graduates. “We have earmarked a budget of Rs 1,000 crore for the current fiscal year and will have around 1,500 new dealerships over the next three years,” Maruti Suzuki’s chief financial officer (CFO) Ajay Seth said. Maruti Suzuki, at present, has the biggest sales network across the country which includes 2,069 dealerships in 1,700 cities. It also sells its premium models from its 280-strong Nexa network. The company has also decided to revamp and expand its used car outlets, labeling the initiative ‘True Value 2.0’. Tata Motors is ramping up investment in dealerships too because the company says it knows that it won’t be able to increase market shares just riding on the back of new launches. “Our network ramp up is one of the initiatives towards increasing our market share,” a spokesperson from the company said. Tata Motors earlier announced a top line investment of Rs 2,500 crore in its passenger vehicle business, a part of which will be diverted to dealership refurbishment and expansion. “Today, 65 per cent of Tata Motors’ customers are less than 35 years of age and more than 50 per cent are less than 25 years of age, these buyers use a gamut of resources to research before buying a car,” said the spokesperson explaining the need to get its showrooms up to speed with their expectations. On the sidelines of the Nexon launch event, Mayank Pareek, head, Passenger Vehicles, Tata Motors had said that the company is now being perceived as young by its increasingly youthful customer base. “Given the recent wave of virtual reality and focus on digital technology, we want to provide a seamless purchase experience to tech-savvy digital customers,” the Tata Motors spokesperson said. While the dealership revamp process will be complete by March 2018, the company says that it will add 100 more outlets in the current fiscal year. The company has also rolled-out an experiential programme called the Tata Motors Experience Centre, which is set up over weekends and lets customers check out some of the new or recently launched models. Skoda, part of the Volkswagen family, has announced an investment of Rs 100 crore for renovation of its 65 dealerships across India. It wants to create a uniform experience, one that is at par with its showrooms across the world. The company says it will also keep the focus on improving its after-sales service, as increasingly customers are asking for more from the brands that they want to drive.